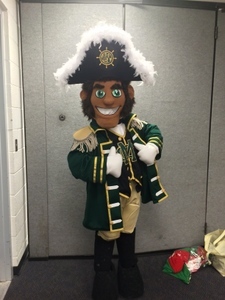 Moreau Catholic High School in San Francisco, California contacted us to help bring a first-ever Mariner mascot to life. Fortunately their student body knew exactly what they wanted out of their skipper - a tanner skinned handsome fella with green eyes, well dressed right down to the white gloves, and someone built to be able to dance like a fool. Enter the Mariner - complete with admiral epilettes and plumed hat (it's magnetic so he doesn't wear it for tumbling). He can also take off his coat and vest and don his school's athletic jerseys. Like other Keystone Mascots costumes the Mariner's nearly all mesh lined and draped, this guy will be able to enjoy the winds coming off the Pacific Coast as he sails Moreau to victory! He already has the moves. Check out the Mariner's "Name Me" video!